I've always been drawn to terrariums. They remind me of Spring, and add beautiful color and life to a room. I have to be honest though. Up until just now, during spell check, I realized that it is terrarium and not terraNium. Oops. So, now I feel silly thinking about all the people I talked to about my terranium. Haha. Anyway, I made one! 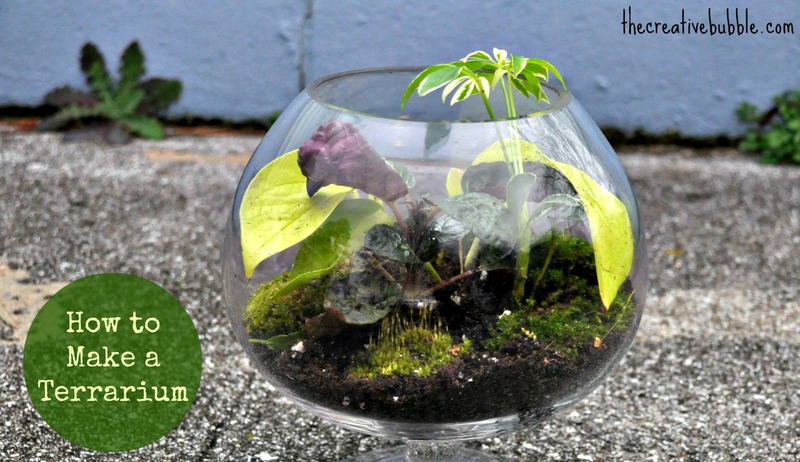 There aren't many tight rules to making a terrarium, so I will explain the basics if you want to make one for yourself. -Uniquely shaped glassware makes a more interesting terrarium. I found mine at TJMaxx. -Try choosing various leaf shapes and colors to add contrast and interest. -I just used dirt from my flowerbed out front. 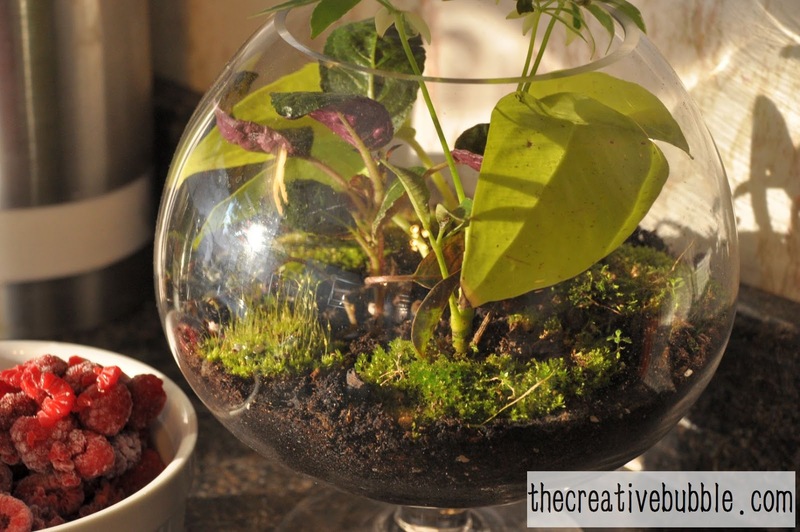 -You can add flare to the terrarium by including moss (I found mine in the yard or you can find it at some craft stores.) or marbles/glass beads. Clean the glass container first. Add a decent amount of soil to the bottom of the glass to ensure that the plants' roots can flourish. Gently separate the roots of the plants you have (if they are too large to fit into the glass). Plant the plants into the soil however you like, making sure the roots are completely covered. Add moss or beads to the top of the soil (optional). Below are the plants that I chose for my terrarium. I didn't actually end up using those glass beads in the glass. I used moss instead. I liked the look of the moss much more. I had enough leftover plants to make a cute, little planter, too! Levi wanted to help mommy play in the dirt. Happy Spring everyone! These terrariums are a great way to bring a bit of the green Spring indoors.